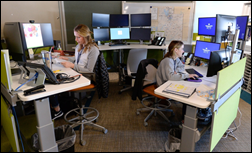 Intermountain Healthcare (UT) ramps up its commitment to virtual care with the launch of Connect Care Pro, a suite of services that brings together its 35 telemedicine programs under one roof at a new facility staffed by 150 clinicians. The “virtual hospital” will serve the health system’s 22 hospitals, 180 clinics, and nine unaffiliated facilities. Welcome to new HIStalk Platinum Sponsor OnPlan Health. 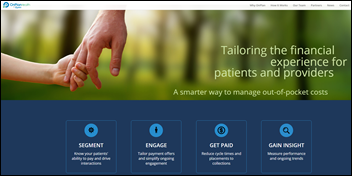 The company, based in Bannockburn, IL, tailors the financial experience of patients and providers by offering a smarter way to manage out-of-pocket costs. Its automated payment support identifies that 50 percent of patients whose past payment history and financial information suggest they will need support paying their bill, then engages with them in creating a customized, pre-approved payment plan. Munson Healthcare found that two-thirds of its payment plans were activated by patients themselves to avoid the time and embarrassment of asking someone at the health system to create a payment plan for them. Rush-Copley Medical Center says that implementing OnPlan increased payments by 10 percent within eight months and lowered average term length while increasing pay-in-fulls. Providers also benefit from fewer placements to collections, reduced staff time, and increased payment security supported by point-to-point encryption and elimination of stored credit card information. Co-founder and CEO John Talaga founded “friendly billing” pioneer HealthCom, acquired by McKesson in 2006 as its first acquisition in forming RelayHealth. Thanks to OnPlan Health for supporting HIStalk. 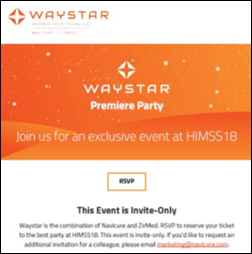 The folks at Waystar Revenue Technology (the recently merged and newly renamed Navicure and ZirMed) will make a $1,000 donation to my DonorsChoose project to honor of the winner of a raffle that will be held at their Waystar Premiere Party at HIMSS18. A name will be drawn from those of attendees who RSVP for the event — which will be held Wednesday evening from 8:00 until 11:00 at the Marquee Nightclub and Dayclub at the Cosmopolitan — and I’ll recognize that person here afterward as having made the company’s donation possible. Teachers, students, and I thank Waystar and the eventual winner for supporting education. MDLive hires Lyle Berkowitz, MD (Northwestern Medicine / Healthfinch) as CMO and EVP of product strategy. Dave Lundal (WellStar Health System) join consulting firm Evergreen Healthcare Partners as managing partner/VP of advisory solutions. Jaffer Traish (Culbert Healthcare Solutions) joins Aunt Bertha – a public benefit corporation that offers an online social service directory that is used by 1 million people — as VP of strategic partnerships. Mercy Technology Services selects Commvault’s cloud-based disaster recovery and backup solutions. 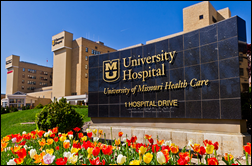 University of Missouri Health Care expands its relationship with Cerner to include RCM services. 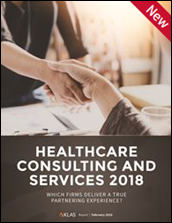 A new KLAS report that asked providers to rate consulting firms they’ve worked with finds that Nordic and Deloitte were most often perceived as true partners, while Advisory Board was by far the firm providers would not use again because of disappointing outcomes and use of inexperienced consultants. Chartis Group, Deloitte, and PwC were perceived as having the broadest range of services; Impact Advisors was named as having the most IT advisory depth; and clients said Nordic has the most implementation depth. RelayHealth Pharmacy Solutions and CoverMyMeds – both owned by McKesson—announce RxBenefitClarity, a real-time prescription benefits and prior authorization decision support tool that covers all payers. In another attempt at relevancy in healthcare, Microsoft launches cloud-based AI and machine learning tools, plus security and compliance templates for moving health data to its Azure cloud. 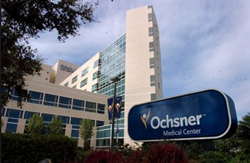 Early adopters include Ochsner Health System (LA) — which has partnered with its vendor Epic to determine if Microsoft’s AI can predict patient deterioration — and UPMC, which is test driving Microsoft’s new AI-powered transcription software. 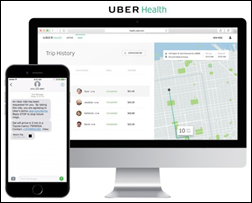 Uber develops a HIPAA-compliant service that will enable providers to arrange rides for patients to and from appointments. Before everyone wets themselves with “Uber in healthcare” excitement, remember, it’s just a taxi service. 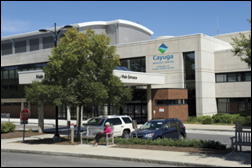 Cayuga Medical Center (NY) implements CloudWave’s real-time infrastructure monitoring and management services for its Meditech EHR. 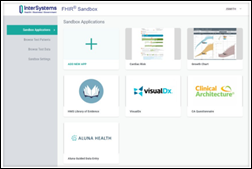 InterSystems develops a FHIR testing environment for developers. LogicStream Health announces GA of a clinical process module designed to help providers prevent opioid misuse. A PatientSafe Solutions survey on clinical communication preferences finds that over half of IT respondents plan to deploy smartphone-based clinical communications, most within the next two years. Military officials are pleased with the first-year progress of MHS Genesis, comparing the rollout of the Cerner system at four sites more favorably to similar implementations last year at three of Cerner’s private-sector customers. They are confident that full deployment will begin in 2019 and DoD-wide implementation will be finished in 2022. SymphonyRM will present its HealthOS platform, which combines CRM and data science, at HIMS18’s VentureConnect session, one of six startups chosen. Qualcomm Life will resell PeriGen’s PeriWatch Vigilance, an early warning system for OB patient deterioration. Fortified Health Security is named Healthcare IoT Cybersecurity Company of the Year by Frost & Sullivan. Medhost delivers its largest-ever product release. Medhost’s largest product release in history also sets quality success records. The Surescripts Network Alliance helps improve prescribing accuracy by 26 percent. KLAS recognizes Lightbeam Health Solutions and Arcadia in its latest population health management report. MedData and Experian Health will exhibit at MGMA FMPC 2018 March 4-6 in Orlando. PerfectServe and Philips Wellcentive will exhibit at the AMGA 2018 Annual Conference March 7 in Phoenix. Docent Health adds mobile messaging capabilities from MPulse Mobile to its patient engagement platform. Ellkay will launch at HIMSS18 the LKClinicalDataExchange data exchange platform. Wolters Kluwer Health expands its Reference Data Management tool to include professional services capabilities. Arcadia achieves high customer satisfaction marks the KLAS 2017 Value-Based Care Managed Services Report. Spok expands its partnership with Spectralink. InterSystems partners with critical care company Zoll Medical to improve exchange of PHI between EMS providers, physicians, and EDs. Black Book Research gives QuadraMed, a division of Harris Healthcare, top ranking for its EMPI software and clean-up services. Forbes profiles ZappRx CEO Zoë Barry. Diameter Health partners with the Kansas Health Information Network to publish a study highlighting the use of HIE data in the calculation of quality measures.